I made my way to the post office today to ship the barter package. I managed to get it all in one box. More than one person observed that it was a large box. Now, it makes its trek across the country. I hope she likes everything. I want this exchange to go well. I have had less-than magic trading experiences in the past. Before I took off for the post office, I waited for my mail to arrive. I knew that my fiber would be here today, and I was right. It is even more wonderful than I saw in the photos. It is tons better than what my photographic skills can show. I wish that I were finishing out NaSpiMoMo with spinning, but I do not think it is going to happen. Some pain conditions are being loud today. It is not terrible, but sitting down to the wheel would not be as enjoyable as it should. It all works out for the best. The sweaters have a chance at some progress tonight. Sleeves continue. First a TYC (done), then an EPS FIYC (nearly done), then I begin another TYC. People who already thought my sanity shaky believe me to have completely lost it when they see that I am knitting a cardigan for myself out of Palette. When I first arrived on Monday night, the table was populated by new people who found our gathering through Ravelry. They were knitting socks. They saw the beginning of my sleeve and thought I was knitting a sock, too. They gave me a wary look when I told them it was the sleeve to a sweater. They seem to doubt that I will complete this project. 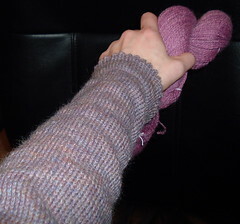 By the end of the night, I had finished all of my sleeve increases and was working straight stockinette. I would show a picture of me with mismatched sleeves, but it is hard to take that picture yourself. 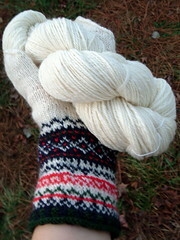 Instead, please enjoy me in my EPS FIYC sleeve holding my Shetland/Angora handspun. When there is endless stockinette, I find myself searching and surfing. Sometimes I end up on eBay. It is no surprise that I was not top bidder on a copy of Charlene Schurch's Mostly Mittens. I never bid on it. I would not have spent days pushing the price higher. I would have waited for the end. However, it passed my price range days ago, but I had to see what the final bid was. It went for $127.50 with shipping. That is why it is not mine. Also, I have not finished the two pairs of mittens I have in progress, not to mention the long line of patterns I already own and hope to knit. Then there is that pair I saw a picture of that I am going to figure out on my own. Of course, I need a one more ball of Palette to make those, and that is way down the line. Besides, I have never even seen this book in person. I know of a friend who owns it. I bet I have another friend who owns it and does not know it. I can wait. That's right eBay; you are beaten by patience and real life. Speaking of waiting, I have not received a response from Knit Picks on a set of defective cords I received. Both in the package were bad. If I do not hear from them tomorrow, I will give them a call. I have not really even thought of the waiting time on some fiber that is on its way to me. However, I will be on the lookout for the results of a swap. I am clearing out a huge bunch of crochet cotton thread. In return, I will receive some wool yarn. I just need to finish packaging it all up and get it shipped. I think this is going to take four boxes. I believe I have found an extra prize to include in each box. p.s. It's almost Groundhog Day! I love beads. Their tiny, sparkly, shiny beauty captured me long ago. They are tiny treasures. Magpie tendencies, much? I loved to buy the huge value packs of beads from craft stores when I was little. I liked to sort the different colors. I got in trouble more than once when my beads got loose. I remember vacuuming my room and hearing the rattle of seed beads that had hidden themselves in the carpet. I spend more time just looking at my beads than creating with them. This is the only little beaded bag that I have knit and not given away. I may make a different one that could be sturdy enough to live in my purse. I know that it would only end in disaster, but I would like to carry such a treasure with me every day. The weather people predicted icy nastiness for Friday night. That meant no NAKG for me. The weather people were wrong. I am glad they were wrong, but I missed getting out to knit with everyone. I have a feeling I am not the only one who stayed in, so even if I had gone, I would have probably been knitting by myself. We had a wonderful Saturday night with our daughter. We do not get to see the kids often enough. I hope her schedule works so that we are able to see her again this week. Whenever we do get to see her, she will have a new hat. When she expressed a desire for one, I grabbed Hats On! by Charlene Schurch. She did not find anything that caught her eye. She said she liked something plainer. I asked what color she would like. She was not looking for excitement in her color either, and decided that white would be best. I grabbed a ball of Woolease and IK Fall 2007. I flipped to the Snowball Hat. She likes it, but perhaps not the pompom atop it. I reached into the needle drawer, pulled out a circ, and cast on for the hat. After working the ribbing and a repeat or two, I tried it on her. It looked like it might work, but also thought about ripping it out and adding another sixteen stitches. As with all visits, this one was too short, but I kept plugging away at the hat. 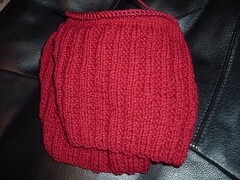 I followed the directions, and when I finished the decreases, the hat looked really small and had a ton of stitches left. I understood the need for the massive puffball on this hat. I did more decreases and ended up with a nice hat. It will not be for my daughter, though. Long gone are the days when this hat would have fit her. It was fine. I have another place where this wee hat could go. I weighed the finished hat and the remaining ball of yarn. 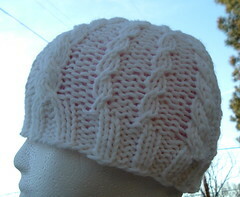 I could make a new hat, and this time I would double the yarn as the pattern directed. This second hat is going to work for her, and I am so pleased. This means it is also time to plan a hat for her brother. I was nearly knocked over the other day when he asked when I was going to knit for him. I think it will be a plain, black hat with his name in Japanese worked in either red or white. I just need to find out which is his favorite way of having his name written in Japanese. I had hoped to be able to show you my finished Shetland/Angora yarn today. However, it took somewhere around fortyleven washes to stop getting pink water. This means that it is just now beginning its drying. I think there are somewhere between 250-300 yards in the yarn that I finished. There is a possibility that NaSpiMoMo will extend into February, and I hope it happens. I would love to continue spinning more with everyone. Also, I happened upon a fiber de-stashing, and I picked up a bit more fiber. It was only about an additional twenty ounces, but that means the fiber box is probably going to be overflowing once more. It is on that note that I make my way to an organizing task. It is a constant two steps forward, three steps back thing. Still, it will be worth it when I am able to get to the things I have and enjoy them without undertaking a major excavating expedition. I have been spinning a good bit this week. I have a couple of bobbins with Shetland/Angora singles ready for plying. I think I might like using my stability ball as my spinning chair. I do get a bit more of a workout, and when I need a break, I just roll away from the wheel and I am set to do some nice stretches. I do like that ball for stretching my back, especially. Anyway, this fluff was nice to spin. There were some bits that I had to pick out, and a wee bit of the VM, but overall, it went pretty smoothly. I do not know what yardage to expect, but I hope there will be enough to knit a lace scarf. We shall see after the yarn is finished. I think it would be wonderful to have enough to knit the Stork's Nest Scarf by Nancy Bush. Yes, I picked up the current issue of Piecework. It is their knitting issue, and it has more than one pattern I would like to try. I have never tried the Rovaniemi Mitten Technique, and it looks like it could be worth the effort. Although the pattern in the magazine is for fingerless mittens, I would probably finish the patterning and make mittens that would keep my fingers warm. I also found a better rhythm with my intarsia project. So much so, that I purchased a few more yarn bobbins for possible future intarsia-insanity. Yes, my insanity is well documented, and it seems to have grabbed hold of my knitting, too. One more thing before I go--I said that I love being an Aunt. I never expressed a wish for more Ants in my home. Ants, go away, please! Being an Aunt is Awesome. I get to experience much of the joy of children I would otherwise miss, while avoiding many of the less pleasant aspects of parenthood. I get to spend time with bright, inquisitive, energetic, entertaining young people, and return them to their parents when I am tired. I can take the silly that will not stop. I can be enthusiastic about an evening of Go Fish, Crazy Eights, Bingo, and checkers from the Shrek treasure chest of games without losing my mind because it will not be my after dinner plans for the next seventeen nights. I can share knitting. I ca n make a Darth Vader birthday cake without the extra hands and constant questions impeding my progress. I get to be the fun one. I can say yes to ice cream and crap from vending machines. I can put on Easter egg hunts. I do not have to battle over food, shoes, and clothes, and I get love in return. When new yarn arrives in the mail, I like to spend some time just admiring it. I have been doing so with the latest shipment from Knit Picks. Yes, it arrived. There was a small adventure involving wintry precipitation and a car chase. It was not nearly as exciting as you might imagine. Anyway, I love the colors of the extra balls of Palette that I ordered, and enjoy looking at them. Not much else was accomplished yesterday. I managed to knit a few more rows on the secret knitting. This was possible only after untangling the project. It is only necessary to look at it wrong to end up with a tangled mess. Still, it is worth the extra effort, and really looks good. I like to try on my sleeve for the TYC. I finished off the day by joining the next ball of yarn. I think I might try to get both sleeves up to the point where they join the body of the cardi before casting on for my EPS FIYC. Still, the needles itch for that project, and I may not be able to wait that long. In other news, a great big ol' Happy Birthday to my favorite six-year-old! Happy Birthday, Robuddy! I'm working on the cake. I thought that the sleeve-work would move swiftly, but I was wrong. I have worked my help sheet for knitting the sleeves on my TYC. I do not have too much to show for actual knitting progress, but I have good reasons for this. I made it out to be with the Skanks on Monday and stayed most of the time. It went pretty well. Much of my time that night went to teaching. I managed to teach two new people to knit. They are already crocheters, so my job was easy. By the time I left, the long-tail cast on, and the knit stitch were mastered. There was also some tinking and catching of mistakes. I demonstrated the knitted cast on, and taught one of the ladies how to bind off, too. There was a brief gauge lesson, and we determined how many stitches she needs to cast on to begin the baby blanket she wants to knit. They showered me with compliments, but I think it had less to do with my teaching abilities and more to do with their needle arts skills. Another reason for the slow progress on the sleeve is that I have been doing some stealth knitting. Yep, those bobbins are part of it. Intarsia is a new one for me. I am about halfway through with this project. It is not portable (see bobbins), but I have gotten down a nice rhythm with it. It is worth noting that this particular piece requires seven bobbins. Ah, but it looks good. I like to stop and admire both the front and the back of the project, as they both look good. I cannot show you more, because I do not always know who peeks in on the blog. I would rather be safe than sorry, even though I am pretty sure that the recipient of this secret knitting is not one of my loyal readers. Beneath the sleeve and bobbins, you see that blue stuff. There was some yarn up for grabs on Monday, so I snagged two balls. I think I have an idea for this. It could become more sneaky knitting. It is just as well that my Knit Picks order did not arrive today. Yes, the in-home estimator predicted delivery for the 15th, but it was wrong. Surely, it will arrive on Wednesday, and perhaps I will be past the garter rib on the first sleeve. The excitement just never ends around here, does it? 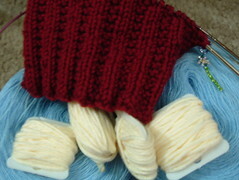 I need only increase one more time and knit some plain rows before setting the body of the TYC aside and none too soon. Knit Picks informs me that my order has shipped. Maybe it is time to grab the tape measure to see if my plan is working before I get too far ahead of myself. Let us also not forget, there is the matter of putting the body on waste yarn to check that other issue of fit. Anyway, I am ready to begin the sleeves. The rounds on those sleeves will seem so short compared to the long rows I have been knitting on the main part of the cardigan. Prepare yourself for the excitement that is my contribution to ABC-Along 2008. All it took was a little encouragement, and I decided to go for it. I hope to have fun with this, and maybe give a jumpstart to the positive, creative part of my brain. Before I get going on any other knitting, I have to attach buttons to a baby sweater. The shower is tomorrow. Ack! Well, I did not make it out Monday to be with my Skanks. It was part time and transportation, and part nerves. I will go next time. I should not be nervous about it. I did make it out Tuesday afternoon for the NAKG time, and managed to get a few rows on the TYC done. I received a challenge to have much to show on the TYC at the end of the month. I am not sure how successful I will be with that. I received a note from Knit Picks. They are sorry that their warehouse/shipping move has taken longer than anticipated. They also regret that the changes have affected my order. I take this to mean that I have a long wait. This is not a big deal. I have so much to work on right now. Maybe I will get more done on that TYC. Speaking of the TYC, I am past the garter rib! The color is way off in this picture, but it is the best I can get tonight. I am going to make some changes on the increases in the plain stockinette portion of the body. Since my stitch gauge is off, my row gauge is also not matching that stated in the pattern. I am paying more attention to my tape measure and schematic to continue knitting this cardigan. I hope it works out. It would be wonderful to have this garment finished up to the point when it is time to work the cable chart by the time my Knit Picks order arrives. That would greatly increase my chances for a timely finish. Whatever happens, this is great practice for my EPS FIYC. I am thinking about joining the ABC-Along 2008. It might be fun. I have passed over some other -alongs because I did not feel up to the pressure, but this might be a good match for me. Speaking of -alongs, I could show you more of my NaSpiMoMo results if I could take a decent picture. It is purple. It does not feel too nice to me. It may not all be me. I was not super thrilled with the fiber as I spun it. I have more of this Romney/Mohair blend. Maybe I can do better with it later. I still have the option of treating the yarn harshly in hopes of improving it. Maybe I will try that if I have trouble sleeping tonight. The verdict is not yet in on my latest spinning. I plied this afternoon, and now it is skein-washing time. If it needs a bit more help, I will treat it harshly. It is the Romney/Mohair blend. I think I have about 200 yards of this yarn, now. This was a pretty quick spinning to finished yarn adventure. I will share with you some spinning that I think will work, and one finished mitten. I spun up the superwash a while back, and it rested for quite some time before plying. Now that I have two left mittens from two different pairs finished, I can cast on for the mates. I had begun the decreases on the top of my mitten too soon and had to rip back and add a few more rounds of plain knitting, but now I think I have it right. I have not woven in the ends or washed it so I can better match the right mitten to what I have done on the left. I suppose I could weave in ends, but that is not the task for today. I was a bit distressed to read that Sock Madness 2 is in danger of not happening. It was such a neat event last year, and I hoped to participate again this year. Hop on over and add your input, and help, if you can. Still no word on my Knit Picks order. I just did another check on the gmail to see if there was a notice of it shipping, but no such luck. However, I did get a surprise. It would seem that there has been a hiccup in my gmail notification. I was wondering why I the inbox was so quiet. Now I must catch up from the fourth, onward. I do feel a little better, and some insecurities have been quieted. Speaking of insecurities, I had a bad dream the other day. I took a nap after posting the colors for my EPS Fair Isle Yoke Cardigan. I dreamed that I got all of these nasty emails and comments about how those colors would not work, and that I did not understand the pattern. Continuing on this thread, I am not sure if I am making it out to knit with the Skanky Knitters tonight. I do not know if I am up for it or not. My husband is off visiting his sister. If he returns in time for me to go, then it is meant to be. If not, I will give it a go next Monday. I will get ready for it just in case. Also, I have to catch up on email. I do not have much for current picture-worthy knitting on the needles. My left mitten is ready for its top decreases. After I finish this one, I think I will cast on for my husband's right mitten. Then there's the TYC, and I think I am just about to the end of the garter rib on the body. Exciting, eh? I hope to be able to sit and knit on it to get progress that is more substantial. All of this that I would like to have finished makes the wait for the yarn for the FIYC more bearable. It would be great to have most of it done by the time my order arrives. My first go at the worm spit went pretty well. That is a different fiber, but I think I might like it. I will probably ply it this weekend or next week, and then I would dye the resulting yarn. I have some ideas about a lace shawl from handspun silk, but that is something for further down the road. Speaking of spit, I saw an oozing, irritable, three-year-old niece over the weekend. No, I did not realize the visit would include unfortunate contagion, or I would have skipped the opportunity to see her. Still, they change so quickly, and I do not want to miss all of it. She often chooses to communicate in No's, growls and shrieks, so I am sometimes caught off guard by a complete sentence. Her Papa was apparently not building the Legos the way she wanted, so she said, "Stop it before I pinch you." Anyway, now, I have her cold. It is not too bad, but it is not fun, either. I have been spinning up some Romney/Mohair roving. I do not love it. There was a little vm and lesser quality fiber bits in there that needed to be removed, and that has taken away from my enjoyment of the spinning. We will see what kind of yarn I get from it. I am hoping to be pleasantly surprised, but not counting on it. I have about 25g more to go before it will be plying time. The new year has begun, and with it, NaSpiMoMo. It is a month to spin more. I am ready. Having plied and finished that superwash was somewhat inspirational. It is much softer than much of what I have spun in the past. It was good to sit back down at the wheel after the extended time away. Also, I am waiting for the yarn to arrive for my Fair Isle Yoke Cardigan, and spinning is such a nice way to spend time. I am beginning with a little bag of silk. A friend gave this to me for Christmas, and I am eager to try it. This is my first go with silk. It feels so nice. I wonder how it will spin up. I may even have a go at dyeing this stuff. I am thinking bright, loud colors might be right for this. Beyond spinning more, I am not setting myself any spinning goals for the month, but I do have a hope. I would like to spin enough so that my fiber stash fits in its container. It outgrew its box last year a little.